Editor’s Note: This historical account of Sojourner Truth, (1797 -1883) by National Women’s History Museum was edited by Debra Michals, PhD. A former slave, Sojourner Truth became an outspoken advocate for abolition, temperance, and civil and women’s rights in the nineteenth century. Her Civil War work earned her an invitation to meet President Abraham Lincoln in 1864. Truth was born Isabella Bomfree, a slave in Dutch-speaking Ulster County, New York in 1797. She was bought and sold four times, and subjected to harsh physical labor and violent punishments. In her teens, she was united with another slave with whom she had five children, beginning in 1815. In 1827—a year before New York’s law freeing slaves was to take effect—Truth ran away with her infant Sophia to a nearby abolitionist family, the Van Wageners. The family bought her freedom for twenty dollars and helped Truth successfully sue for the return of her five-year-old-son Peter, who was illegally sold into slavery in Alabama. Truth moved to New York City in 1828, where she worked for a local minister. By the early 1830s, she participated in the religious revivals that were sweeping the state and became a charismatic speaker. 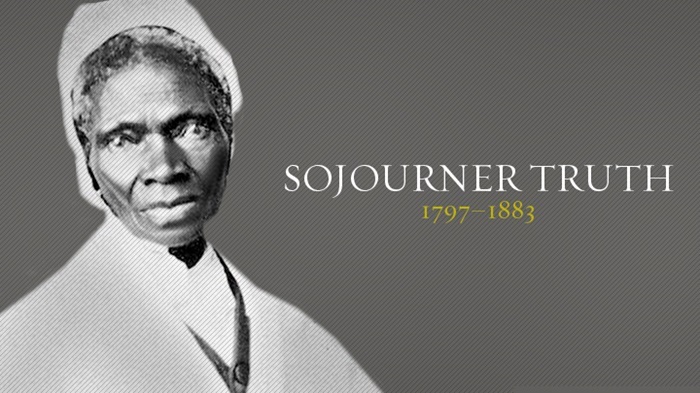 In 1843, she declared that the Spirit called on her to preach the truth, renaming herself Sojourner Truth. As an itinerant preacher, Truth met abolitionists William Lloyd Garrison and Frederick Douglass. Garrison’s anti-slavery organization encouraged Truth to give speeches about the evils of slavery. She never learned to read or write. In 1850, she dictated what would become her autobiography—The Narrative of Sojourner Truth—to Olive Gilbert, who assisted in its publication. Truth survived on sales of the book, which also brought her national recognition. She met women’s rights activists, including Elizabeth Cady Stanton and Susan B. Anthony, as well as temperance advocates—both causes she quickly championed. In 1851, Truth began a lecture tour that included a women’s rights conference in Akron, Ohio, where she delivered her famous “Ain’t I a Woman?” speech. In it, she challenged prevailing notions of racial and gender inferiority and inequality by reminding listeners of her combined strength (Truth was nearly six feet tall) and female status. Truth ultimately split with Douglass, who believed suffrage for formerly enslaved men should come before women’s suffrage; she thought both should occur simultaneously. During the 1850’s, Truth settled in Battle Creek, Michigan, where three of her daughters lived. She continued speaking nationally and helped slaves escape to freedom. When the Civil War started, Truth urged young men to join the Union cause and organized supplies for black troops. After the war, she was honored with an invitation to the White House and became involved with the Freedmen’s Bureau, helping freed slaves find jobs and build new lives. While in Washington, DC, she lobbied against segregation, and in the mid 1860s, when a streetcar conductor tried to violently block her from riding, she ensured his arrest and won her subsequent case. In the late 1860s, she collected thousands of signatures on a petition to provide former slaves with land, though Congress never took action. Nearly blind and deaf towards the end of her life, Truth spent her final years in Michigan. Women have been making history since the beginning of time. Learn more by visiting: www.womenshistory.org. This entry was posted in Archives, Culture and tagged sojourner truth, women's history museum on February 1, 2019 by jlenoir.